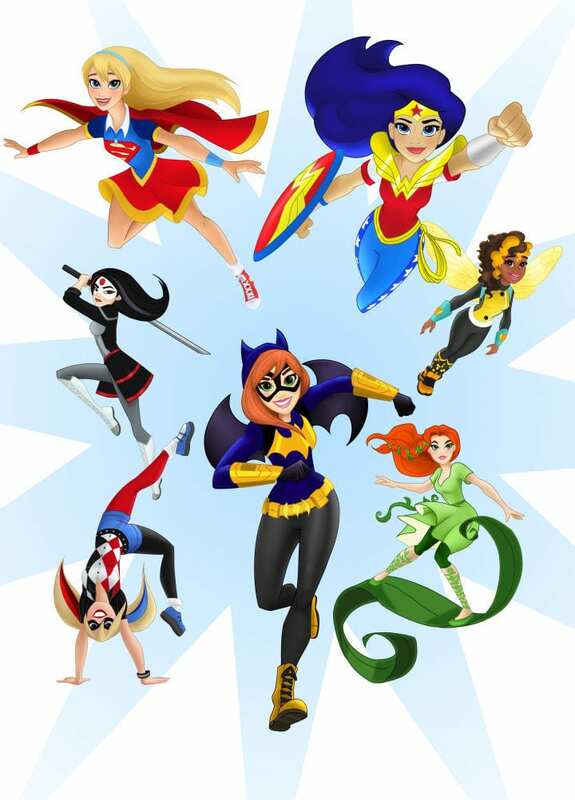 Will the ‘DC Super Hero Girls’ Line be the Princess Alternative I’m Looking For? Superheroes are for boys. That’s a fact. What’s also true, but less accepted, is that superheroes are for girls too. So it’s great that DC and Warner are acknowledging this with their new project ‘DC Super Hero Girls’. As the geek dad of a little girl, trying desperately to introduce her to alternatives to Disney Princesses and the like, I know how difficult it is to find appropriate content and merchandise featuring female superheroes, so when I first read about this I was excited. It features teenage versions (hence justifying the ‘girls’ tag) of Wonder Woman, Supergirl, and Batgirl (who were in my Top Five Awesome Alternatives to Disney Princesses). The likes of Harley Quinn, Bumble Bee, Poison Ivy, and Katana will also be involved. The target audience is girls age 6-12. Finally, we have a big media corporation acknowledging what we keep banging on about – that there is an untapped market of girls who love superheroes. Glancing at the artwork, I thought how refreshing to see a group of female characters for girls in dynamic action poses, rather than the passive imagery that usually adorns apparel and accessories in the ‘pink’ aisle. But taking a closer look at the artwork, I started to have some doubts. I realised that they all look like generic Disney Princess clones, which potentially alludes to the marketing intentions of those involved – going after Disney’s share of the girls merchandise market. If they do this by offering superhero culture as a real alternative to princess culture, that would be great. But if they take these superheroes too far in the direction of Disney’s heroines, it will be little more than a cynical market grab than trying to create a different offering. There are also issues of body image – while superheroes have always been visually hyper-realistic there’s a big difference between males having big abs and girls having waists smaller than their heads. Then there’s the idea that this is being “designed just for girls”. It’s important to Include boys in anything involving female superheroes, so they understand from an early age that this genre is for girls too. I still read of boys telling girls that they can’t be into superheroes/Star Wars, only boys can. Subdividing the genre to create a girls only space clearly doesn’t promote inclusion. The involvement of Barbie manufacturer Mattel is another worrying sign. While it’s worth noting they’ve said they’re making “action figures”, not dolls, this is the company that has presented a narrow view of femininity with Barbie for decades. If you want to see the kind of female superhero THEY think little girls want to play with, look no further than their recent Barbie superhero Super Sparkle, a pink and glittery princess who gets super powers from being kissed by a magical butterfly. You can bet Mattel have noticed that Wonder Woman, as well as being a superhero, is also a princess. There’s also the mention of LEGO, and “their experience and success engaging girls”. This can only be alluding to their LEGO Friends brand, the popular but divisive line of LEGO for girls, a pink and pastel gender ghetto that exists away from the rest of LEGO’s creative construction toys. A dedicated girls LEGO implicitly defines the rest of to as for boys. I worry the same thing could happen here. And that they’ll make a superhero spa playset. And finally, they’re not even superheroes! They’re called ‘Super Hero Girls’ not ‘Superhero Girls’. The cynic in me suspects the thinking is that superheroes are for boys, but these ‘super heroes’ are for girls. Am I being overly pessimistic? Probably. I would love this to be awesome. In a time when female superhero characters such as Black Widow, Gamora, and Big Hero 6’s Go-Go and Honey Lemon are routinely removed from merchandise, a new female superhero range is great. There’s no way they can ignore the female characters when they’re ALL female! So we should get a viable alternative to the pink & pastel shimmer & sparkle female characters of the moment. I hope that the cartoons, books, and comics provides wonderful character led tales of action, adventure, and inspiration with a diverse range of female superheroes (and villains). The lead writer of the project is a woman, Shea Fontana, so we’re not simply getting a male idea of what they think little girls like. But ultimately, the reason I want my daughter to be exposed to female superheroes is to offer her an alternative to the current mass market merchandise targeted to girls. If DC Super Hero Girls is simply a cynical way to combine aspects of Disney Princesses and Barbie in order to get a piece of the existing ‘girl’ market, then it’s no real alternative at all. I’d love to know what you think about this ‘DC Super Hero Girls’ line. Please comment below, join the conversation on the Facebook page, or on Twitter @manvspink. I’m optimistic, but I feel that it might be all too easy to screw it up. I have to say as soon as I saw this (in particular the artwork) I just thought, “Urgh”. The tiny waists, the big doe eyes, there is very little differentiating them from Disney princesses. You’re not being cynical, just realistic! I think it’s time we started coming up with our own kick arse female comic book characters, and helped our young daughters invent their own. Its a step in the right direction but I agree that the artwork depicts princesses with capes. Just this morning daughter indicated she wanted BATMAN shoes not Batgirl shoes. She was very clear she wanted pink shoes with a picture of Batman. My son was very quick to correct her and tell her she wanted batgirl shoes. It is interesting how from a boys perspective batman was not an option for her. I am confused about why girls cant like boy superheroes, too. I think it is important to have girl superheros role models but why does the marketing and products have to always be gender specific?